Associate lawyer in MHLawyers SCP law firm since 2018. 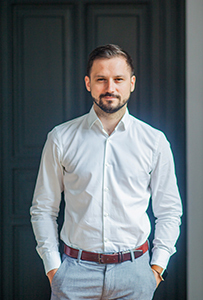 Associate lawyer in Hodoș Miheț și Asociații S.P.R.L. law firm between 2012 and 2018. The main areas of expertise are tax law, commercial law, contracts, insolvency, energy. He graduated from the INPPA in 2015, becoming a qualified lawyer. He attended Msc. International Business, University of Leeds, United Kingdom, 2011-2012. Degree in law Babeş – Bolyai University in Cluj Napoca, Law School, 2011.